Astronomers believe a bright dwarf galaxy relatively close to Earth’s Milky Way and trailing fireballs is the first clear example of a galaxy in the act of dying. The galaxy, in the Virgo Cluster, is called IC3418. INDIANAPOLIS — A galaxy has been observed in its cosmic death-throes for the first time. 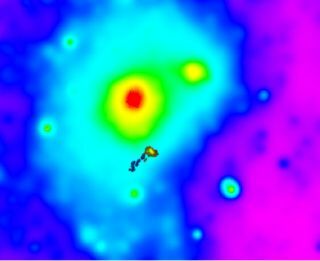 New research shows that a bright dwarf galaxy in a cluster near the Milky Way is losing its gas, creating a tail of fireballs expelled from the innards of the galaxy. The galaxy, called IC 3418, appears to be moving from one phase of galactic evolution into another. IC 3418 is located in the Virgo Cluster — a group of about 1,000 galaxies and the cluster closest to the Milky Way's Local Group of galaxies. An alternate-color version of a photo of the dwarf galaxy IC3418, which appears to be in the process of dying. Scientists think that IC 3418 stopped making new stars about 200 to 300 million years ago, rendering the galaxy effectively infertile, the researchers said. "Stars, planets, and life can form only if a galaxy has gas to make them," Kenney said. The galaxy's fireball tail, however, does show signs of new star formation. The gas within IC 3418 is forced outside of the galaxy by pressure given off by other galaxies in the cluster. "If you hold popcorn and unpopped kernels of corn in your hand and stick it out the car window as you drive, the wind caused by the car’s motion through the air will blow away the popcorn but leave the denser unpopped kernels in your hand," Kenney said. "This is like the gas clouds in galaxies being blown out of the galaxy by the wind of cluster gas, while the denser stars remain behind." By observing this dwarf elliptical galaxy— a subspecies of the most common type of galaxy in the universe — it could give astronomers a better sense of how they evolve. "It’s gratifying to find a clear example of an important process in galaxy evolution," Kenney said. "I enjoy digging through evidence to assemble a story about what happens to galaxies. I’ve come to think of myself as an intergalactic forensic pathologist — someone who studies the bodies of galaxies seeking evidence of traumatic events responsible for the present state of the galaxy." Kennedy presented his findings today (June 3) here at the 222nd meeting of the American Astronomical Society.